This is our brand new and artistic Storage Buffet Server Cabinet. Kings Brand Furniture Buffet Server Sideboard Cabinet with Wine Storage. This Beautiful Rich Espresso Finish Sideboard Is A Must-Have Addition To Your Home. Malibu Server in Dark Brown Finish. Easy To Assemble. Strong Construction. Measures: 54 x 18 x 36 H. Check Related Items For Malibu Dining Set and Buffet & Hutch. Server. Beautiful Design With Three Drawers And Storage Features. Easy To Assemble. Size: 52 x 18 x 33H.. Solid Granite Top Server. Features Three Drawers And Two Storage Compartments With Doors. Beautiful Design And Strong Construction. Easy To Assemble. Size: 17 x 41 x 34H..
Server. 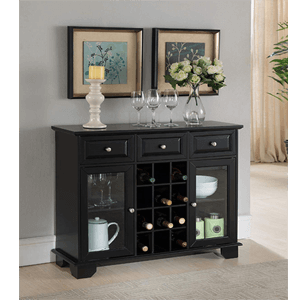 Beautiful Design That Features Three Drawers, Two Storage Compartment With Doors, And Wine Rack. Easy To Assemble. Size: 48 x 17 x 34H..
Satellite Server Featuring Bevelled Glass Top and Wine Rack. Measures: 45 x 17 x 35 H. Store Pick Up Or Local Delivery Only. Check Related Items For Matching Bar Set, Dinette Set and Occasional Table Set. Server Of The Pincess Marble Collection. Beuatiful Design. Features Two Doors And Two Drawers. Size: 56 x 20 x 36H.. Easy To Assemble. Server Of The Gibraltar Collection. Features One Glass Shelf, Two Doors, And One Drawer. Beautiful Design. A Matching Mirror Is Also Available And Sold Separately. Size: 50 x 18 x 36H. Maple Sideboard. Features Two Drawers And Two Storage Compartments With Doors. Beautiful Design. Easy To Assemble. Size: 45 x 16 x 34H..
Sideboard. Beautiful Construction. Features Two Drawers And Two Storage Compartments With Doors. Easy To Assemble. Size: 45 x 16 x 34H..
Server In Capuccino Finish. Server With Storage And Wine Rack. Size: 54L., 15-3/4W., 34H. Strong Construction. Easy To Assemble. Server. Beautiful Design. Features Two Storage Compartments With Doors And A Wine Rack. Elegant And Modern Style. Size: 54 x 20 x 64H.. Easy To Assemble. Pine Veneer Server With Wine Rack. Easy To Assemble. Details: Lenght: 43 X Width: 18 X Height: 43-1/2H..
Tobacco Oak Finish Server With Three Drawers And Two Doors For Storage. Size: 54L., 18W., 33H. Strong Construction. Easy To Assemble.